You can listen to the songs at the end of the review (though I am told the youtube audio quality in this case is pretty bad). 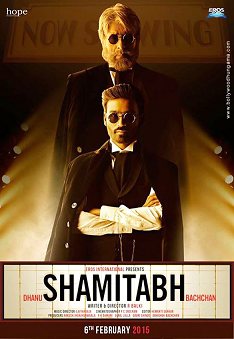 After Mandram Vandha/Kuzhaloodhum Kannanukku/Jotheyali in Cheeni Kum and Thumbee Vaa/Putham Pudhu Kaalai in Paa, the Shamitabh entry for director Balki’s Ilaiyaraaja classics-revisit mission is Aasaiya Kaathula from the 1980 movie Johnny. Arrangement-wise, Stereophonic Sannata is better than what Raja managed with the two adaptations in Paa; particularly liked how the folk percussion beats were recreated using beatbox. And Shruti Haasan hardly has a problem loading her rendition with attitude. What let the song down big time are Swanand Kirkire’s lyrics with which I could just not connect. Despite the strong sense of familiarity in tune and sound, Piddly has enough of that Raja charm in its arrangement to have you hooked. And when it is Amitabh Bachchan’s voice, you tend to listen, that occasional twang of auto-tune notwithstanding. But for some trademark touches by the composer in the interludes, nothing really stands out in Sha Sha Mi Mi. As you can guess from the title, the lyrics (Kausar Munir for this one alone) don’t help much either, thereby wasting Caralisa Monteiro’s efforts as well. It’s Suraj Jagan who bags half the songs in the soundtrack. Of which Thappad (where he is joined by rapper Earl D’Souza) goes pretty much the same way as Sha Sha.. A few notable moments in the arrangement (the violin-guitar combination in the second interlude especially), unimpressive track otherwise. Lifebuoy is a curious piece – the classic jingle is given a mod makeover (with a more violent attitude towards the keetaanu) – and stays in mind more for the novelty than for the quality of the piece. It is Suraj’s third song that is the best of the soundtrack, the ode to cinema called Ishq-e-Fillum. The singing is excellent here, particularly where the harmonies join in. The orchestration is top class too, synth-dominated like the rest of the soundtrack, with the occasional nifty touches like the sax. Balki may have the best intentions in getting Ilaiyaraaja to compose for his Bollywood projects, but the combination doesn’t seem to yield the best results. Well Cheeni Kum would count as an exception but that rode entirely on Raja’s yesteryear tunes. Obnoxious commenters typing in caps and all. Obvious trolls. ilayaraja is a great MD.but unfortunately he passed his best time.ilayaraja done his best works in 70’s 80’s and 90’s .after 2000 there were very rare albums of him to say good.anyway this is an average album and i am completely agree with reviewr’s rating. This is MOST JUNK review I have ever read. Please dont write any more reviews you surely dont have the stuff in you even think about music. THE WEBSITE NAME IS MUSICALOUD.COM. IT SHOWS THAT THE REVIWER HERE THINKS ANYTHING LOUD IS GOOD MUSIC. LOL. Lol musicaloud when Linga and I got 8/10 this album deserves 20/10. You seem to be biased and iam 100 percent sure about that. Musically Ilayaraja is a zillion times ahead of any composer. Linga and I are the most disgusting and the cheapest albums done by ARR in recent times. Albums like those are a disgrace to Indian music community and people like u who review them and give higher ratings are helping the cause of degrading film music to the level of shouting and barking. If really the music is not working then why to give 7 out of 10???.. THE CAT IS OUT. Captivating to say the least!